“The Front Runner” is exactly the kind of film we don't need in our current moment, and that makes its insistence on its own relevance much more grating. When the sheer amount of charm that is Hugh Jackman isn't enough to make a movie at least tolerable, things have hit a whole new low. Jackman plays Gary Hart, the quintessential front runner for the Democratic nomination for President in 1988 during the three weeks that led him to drop out of the race. The movie depicts him as a man's man, someone who is just as adept at spinning complicated political topics into sound bites for the public and the press, as well as photogenic, charismatic, and focused on what is best for the country, with his manly background as a Coloradoan giving him what is necessary to beat the Republicans. Just how masculine is he? He proves his competence at an axe-throwing contest. In other words? Hart is the ideal candidate in every way, save for his tragic unawareness of how substance is being subsumed by style in politics. Also the womanizing. The press is aware of the rumors about his marriage, but unwilling to delve into them, especially a reporter from the Washington Post who starts out as antagonistic towards Hart, but soon comes to respect him. He is unwilling to ask questions about his personal life, but feels obligated. Then there's the sexist treatment of every female character in the movie, who are firmly divided into two camps. Blondes are sexually viable, with one reporter especially giving off mistress vibes. The brunettes are serious, in some cases so tightly wound they are sure that Hart's womanizing will affect his treatment of women and his policies. The screenwriters are obviously trying to be sensitive, but it's bound to fall flat when the rest of the movie basically depicts Hart as so decent his only flaw is that he's TOO masculine. However, the greatest point of confusion in “The Front Runner” is in how it portrays Hart's mistress, Donna Rice (Sara Paxton). One moment, she regails Hart's campaign manager Bill Dixon (J.K. Simmons) of her accomplishments, assuring him she's no bimbo. “I did everything I was supposed to do to make sure men didn't look at me like you are now,” Rice asserts. The next, she's not only asking about a job on the campaign, she's talking about how she like Hart's positions. It makes no sense. 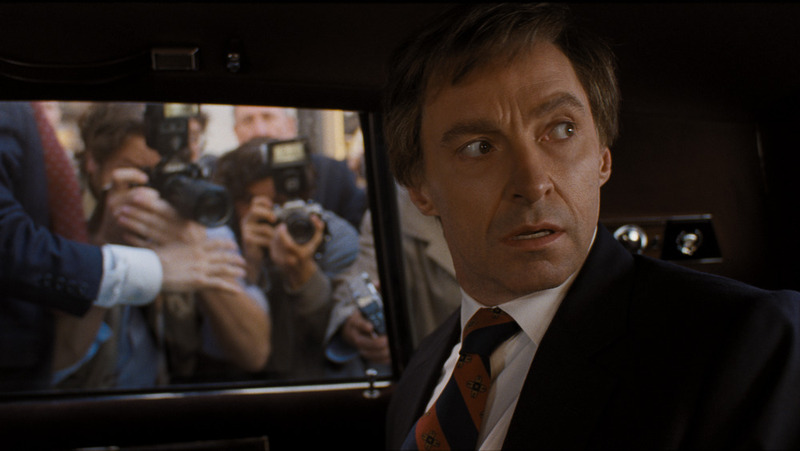 “The Front Runner” does have some good points to make about the growing tabloid nature of even the most prominent, respectable members of the press and how they treat the nomination process. The writers are obviously trying to be self-critical, with Jason Reitman co-writing the script with a journalist and a political consultant. But any good points are lost in the style the movie uses to make its argument. Hart is given the dignity his detractors are not, and in spite of claims to the contrary, the journalists in the film are depicted as the ones responsible for how our political process has devolved. That is a dangerous message to send in our current moment, where there's quite a bit to say about how sexism plays a role in politics, and the complexity of the media's role in holding candidates accountable (or not). When journalists are routinely depicted as enemies of the people, the stance “The Front Runner” chooses to take on it, and its obliviousness to the ramifications, is not only troubling, it's dangerous.